Welcome to the Flexible Survival Wiki. Flexible Survival Wiki is a supporting Wiki for the text-based Flexible Survival MUCK created by Nuku Valente. Its storyline is based in a not-too-distant past of 2008, containing science fiction elements about a nanite-based virus outbreak and its mutation-inducing consequences. The game is based on roleplay and classic hack'n'slash combat, supporting both a web interface as well as a standard MU* telnet client. This wiki is set up to be edited by any registered user, but to be registered, a user must go into the game's MUCK, described below. After creating a character, use the command +wiki/create to start the process toward being a registered user! Use your client to connect to flexiblesurvival.com port 2000, or 2002 for an SSL/TLS connection (some clients may not support this). Alternative ports are available on 2020, 2222, 22222, 20202, and 23 if the main ports are blocked by your service provider. Type 'create yourcharactername yourpassword' and join the mosh pit of mutates and survivors! Know a few nice tricks about MU* clients? Or need a few tips yourself? Check out the UI Guides! Browse useful things others have found, or make one of your own and share you knowledge! 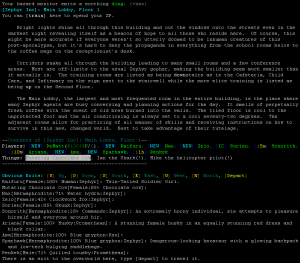 The single-player version of the game can be found at Nuku's blog and is a text-based game with a 'sandbox' feel. On the surface, it is a timed survival game where players must keep their character fed, watered and sane until rescue by the military shortly after the infection of the city by the transformation nanites. There are an array of creatures, events, NPCs and quests (both mini-quests and majour undertakings) to explore and experience. Many of the creatures of the city will attempt to infect the player (often through sexual contact) resulting in body transformations. The game has numerous 'endings' based on how the player is infected at the end of the game, whether they survived or succumbed to the infection, and which NPCs have been encountered and saved. Players new to the game should read the Overall Gameplay article, which contains no spoilers and explains the core concepts of the game. Note: Flexible Survival is, ultimately, a game of exploration. It is intended that players discover content on their own, with the idea that they will gain the most enjoyment from the game in this way. The articles listed in the table below generally contain spoilers for the game in one fashion or another. New and less experienced players are warned that viewing these articles may affect your ultimate enjoyment of the game (if even in only a small way). Proceed at your own discretion. Listed below are a number of articles which contain the details of the game, laid bare for all to see. It is a reference for veteran players and a source newer players may consult to find solutions and answers that are not readily apparent to them through the course of the game. The spiritual ancestor of the single-player version of the game can be found at Nuku's blog and is a text-based game within in map filled with connected rooms. NOTE: These items still need to be filled. This is just a template to build from. Many also contain spoilers for game content. This page was last edited on 20 February 2019, at 21:28.